An IBM hard disk drive with the metal cover removed. The platters are highly reflective. 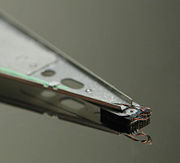 A hard disk drive (HDD), also known as a hard disk or hard drive, is a data storage device used in many types of electronic equipment including computers, digital music players, personal digital assistants, video game consoles, and digital video recorders. A hard drive stores data in small magnetic "grains" placed on solid circular platters. The grains act like small magnets and store data by virtue of their alignment. Data are read and written using a "read/write head" at the end of a "servo arm." Most modern hard drives have multiple platters, read/write heads, and servo arms. 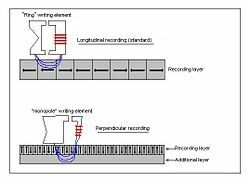 New recording technology (known as perpendicular recording) has allowed for current hard drive capacities to reach the Terabyte mark. As a result, modern electronic devices can store enormous amounts of data of many different types, allowing them to perform a wide range of functions at increasing sophistication. The first storage devices were built by IBM in 1953 and used magnetic tape technology as opposed to platters. The drawbacks that tape storage presents is the time it takes for data to be retrieved from the surface of the magnetic tape, or the access time, and makes data retrieval rather cumbersome. Early computers spend most of the time waiting during the data access. These first hard disk storage devices were large and heavy objects that cost large amounts of money to build and maintain. When the first real hard drives that used magnetic material on platters as the storage medium came out in 1956, they were refrigerator sized machines called the 305 RAMAC (random access method of accounting and control) that cost 3,200 dollars-per-month weighed over 2,000 pounds and stored a mere 5 MB. For many years HDDs were large, expensive and cumbersome devices, more suited to use in the protected environment of a data center or large office than in a harsh industrial environment (due to their delicacy), or small office or home (due to their size and power consumption). In fact, in its factory configuration, the original IBM PC released in 1981 (IBM 5150) was not equipped with a hard disk drive. Before the early 1980s, most HDDs had 8-inch (20 cm) or 14-inch (35 cm) platters, required an equipment rack or a large amount of floor space (especially the large removable-media disks, which were often referred to as "washing machines"), and in many cases needed high-current or even three-phase power due to the large motors they used. Because of this, HDDs were not commonly used with microcomputers until after 1980, when Seagate Technology introduced the ST-506, the first 5.25-inch HDD, with a capacity of 5 megabytes. In 1973, IBM introduced the IBM 3340 "Winchester" disk drive, the first significant commercial use of low mass and low load heads with lubricated media. All modern disk drives now use this technology and/or derivatives thereof. During the 1980s, the term "Winchester" became a common description for all hard disk drives, though generally falling out of use during the 1990s. Most microcomputer HDDs in the early 1980s were not sold under their manufacturer's names, but by Original equipment manufacturers as part of larger peripherals (such as the Corvus Disk System and the Apple ProFile). The IBM PC/XT had an internal HDD, however, and this started a trend toward buying "bare" disks and installing them directly into a system. Hard disk drive makers started marketing to end users as well as OEMs, and by the mid-1990s, HDDs had become available on retail store shelves. While internal disks became the system of choice on PCs, external HDDs remained popular for much longer on the Apple Macintosh and other platforms. The first Apple Macintosh built between 1984 and 1986 had a closed architecture that did not support an external or internal hard drive. In 1986, Apple added a SCSI port on the back, making external expansion easy. External SCSI drives were also popular with older microcomputers such as the Apple II series, and were also used extensively in servers, a usage which is still popular today. The appearance in the late 1990s of high-speed external interfaces such as USB and FireWire has made external disk systems popular among PC users once again, especially for laptop users and users who move large amounts of data between two or more areas, and most HDD makers now make their disks available in external cases. The inside of a hard disk drive with the cover removed. To the left is the actuator arm, with the read-write head at its end suspended over the platters. HDDs record data by magnetizing a magnetic material in a pattern that represents the data. They read the data back by detecting the magnetization of the material. A typical HDD design consists of a spindle which holds one or more flat circular disks called platters, onto which the data is recorded. The platters are made from a nonmagnetic material, usually glass or aluminum, and are coated with a thin layer of magnetic material. Older disks used iron(III) oxide as the magnetic material, but current disks use a cobalt-based alloy. A diagram showing how data is stored and read on the magnetic surface. The platters are spun at very high speeds ranging from 7,200 to 10,000 rpm. The read/write head is used to detect and modify the magnetization of the material immediately under it. There is one head for each magnetic platter surface on the spindle, mounted on a common arm. An actuator arm (or access arm) moves the heads on an arc (roughly radially) across the platters as they spin, allowing each head to access almost the entire surface of the platter as it spins. The magnetic surface of each platter is divided into many small sub-micrometer-sized magnetic regions, each of which is used to encode a single binary unit of information. In today's HDDs each of these magnetic regions is composed of a few-hundred magnetic grains. Each magnetic region forms a magnetic dipole which generates a highly localized magnetic field nearby. Data can be thought to be stored in the orientation of these magnetic regions. Information is written to a platter as it rotates past mechanisms called the read/write heads that fly very close over the magnetic surface. The write head has the ability to change the magnetization of the magnetic region by generating a local magnetic field near to a desired region that is strong enough to change the orientation of the magnetic dipole. Early HDDs used the same inductor that was used to read the data as an electromagnet to create this field. In today's heads the read and write elements are separate but are in close proximity on the head portion of an actuator arm. The read element is typically composed of a giant magnetoresistive (GMR) head while the write element is typically thin-film inductive. Information is read from the platter by the GMR read head which works on the principle of magnetoresistance. The GMR head has the ability to detect a change in the direction of a magnetic field. This change is detected as a change in the 'sense' current that is constantly being passed through the GMR head. As the GMR head passes over regions of differently oriented magnetic grains, the materials in the GMR head change their overall resistance which in turn changes the amount of 'sense' current being passed through the GMR head. The changes detected in the 'sense' current is then processed as information stored on the platter surface. The entire hard disk is in a mostly sealed enclosure that protects the components from dust, condensation, and other sources of contamination. The HDD's read-write heads fly on an air bearing which is a cushion of air only nanometers above the disk surface. The disk surface and the disk's internal environment must therefore be kept immaculate to prevent damage from fingerprints, hair, dust, smoke particles and such, given the sub-microscopic gap between the heads and disk. Using rigid platters and sealing the unit allows much tighter tolerances than in a floppy disk drive. Consequently, hard disk drives can store much more data than floppy disk drives and access and transmit it faster. In 2007, a typical HDD might store between 160 GB and 750 GB of data, rotate at 7,200 to 10,000 revolutions per minute (RPM), and have a sequential media transfer rate of over 80 MB/s. The fastest enterprise HDDs spin at 15,000 RPM, and can achieve sequential media transfer speeds up to and beyond 110 MB/s. Mobile HDDs, which are physically smaller than their desktop and enterprise counterparts, tend to be slower and have less capacity. Since the beginning of the computing age, engineers have been constantly working on improving efficiency, power and function while decreasing size and the time it took for computers to do tasks. Hard drives were constantly being designed to decrease form factor, cost-per-MB and access time, while increasing capacity and data transfer rate. An obvious step in making these improvements would be to decrease the size of the magnetic grains. However, this would require decreasing the “flying height” of the read/write head and the actual size of the read/write head. It also requires better technology to be able to keep the read/write head at a consistent spacing. All these improvements have been researched and implemented into today’s hard drives, however the biggest barrier in increasing data density by far is not the available technology, it is the superparamagnetic barrier. This is a physical phenomenon wherein the decrease in size of the magnetic bits leads to the spontaneous “flipping” of bits. An attempt to use bits of higher coercivity (a property of a magnetic material that is described as the intensity of the applied magnetic field required to reduce the magnetization of that material to zero) will necessitate a larger read/write head because a larger magnetic field will be needed to read/write data and making the head larger would be self-defeating as this would mean the bits would have to be larger so that the head does not write on more that one bit at once. An already-available solution for this is the use of perpendicular magnetic recording (PMR). The magnetic bits are recorded perpendicularly as the name suggests, which increases the storage density as schematically shown at left. PMR uses a soft magnetic under layer which conducts magnetic flux well. When writing, the smaller writing tip generates an intense magnetic field that penetrates into the under layer which strengthens the read back signals and helps decrease the interference from adjacent tracks. Capacity of a hard disk drive is usually quoted in gigabytes, however Tera bytes are now also being used due to increase in data storage capacity. Hard disk drive manufacturers specify disk capacity using the SI definitions of the prefixes mega-, giga-, and tera-. While this is sometimes attributed to deliberate misinformation there is no evidence to support this. Disks with multi-million byte capacity have been available since 1956, when the term "byte" itself was coined, and long before such units were commonly abbreviated. As capacities increased, sizes were abbreviated in marketing and technical literature using the term "millions," and then using standard SI prefixes. To prevent confusion, modern manufacturers state the exact meaning with phrases like, "One gigabyte, or Gbyte, equals one billion bytes when referring to hard drive capacity." In the computer and semiconductor industries the prefix kilo is used to describe 210 (1,024) bits, bytes or words because 1,024 is close to 1,000. Similar usage has been applied to the prefixes mega, giga, tera. Often this non-SI conforming usage is noted by a qualifier such as "1 KB = 1,024 bytes" but the qualifier is sometimes omitted, particularly in marketing literature. Operating systems, such as Microsoft Windows, frequently report capacity using this binary interpretation of the prefixes, which results in a discrepancy between the disk manufacturer's stated capacity and what the system reports. The difference becomes much more noticeable in the multi-gigabyte range. For example, Microsoft's Windows 2000 reports disk capacity both in decimal to 12 or more significant digits and with binary prefixes to 3 significant digits. Thus a disk specified by a disk manufacturer as a 30 GB disk might have its capacity reported by Windows 2000 both as "30,065,098,568 bytes" and "28.0 GB." The disk manufacturer used the SI definition of "giga," 109. However utilities provided by Windows define a gigabyte as 230, or 1,073,741,824, bytes, so the reported capacity of the disk will be closer to 28.0 GB. 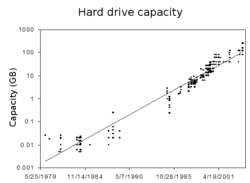 Growth in hard disk drive capacity (in gigabytes) of PCs, over time. The plot is logarithmic, so the fit line corresponds to exponential growth. Access time can be described as the time for the servo arm to reach the desired track and the delay for the rotation of the disk to bring the required sector under the read/write head. Shorter access times make a hard drive faster at finding and reading data stored on the platter. The main way to decrease access time is to increase rotational speed. The physical size of a hard disk drive is quoted in inches. The majority of HDDs used in desktops today are 3.5" wide, while those used in laptops are 2.5" wide. An increasingly common form factor is the 1.8" ATA-7 form factor used inside digital audio players, which provide up to 100GB storage capacity at low power consumption and are highly shock-resistant. A previous 1.8" HDD standard exists, for 2–5GB sized disks that fit directly into a PC card expansion slot. From these, the smaller 1" form factor was evolved, which is designed to fit the dimensions of CF Type II, which is also usually used as storage for portable devices including digital cameras. 1" was a de facto form factor led by IBM's Microdrive, but is now generically called 1" due to other manufacturers producing similar products. There is also a 0.85 inch form factor produced by Toshiba for use in mobile phones and similar applications, including SD/MMC slot compatible HDDs optimized for video storage on 4G handsets. The size designations are more nomenclature than descriptive. The names refer to the width of the disk inserted into the drive rather than the actual width of the entire drive. A 5.25" drive has an actual width of 5.75," a 3.5" drive 4," a 2.5" drive 2.75." A 1.8" drive can have different widths, depending on its form factor. A PCMCIA drive has a width of 54 mm, while an ATA-7 LIF form factor drive has a width of 2.12." An IBM HDD head suspended above the disk platter. The HDD's read/write head relies on an air pressure 'bearing' between itself and the platter to support the heads at their proper flying height while the disk rotates. A HDD requires a certain range of air pressures in order to operate properly. The connection to the external environment and pressure occurs through a small hole in the enclosure (about 1/2 mm in diameter), usually with a carbon filter on the inside (the breather filter, see below). If the air pressure is too low, then there is not enough lift for the flying head, so the head gets too close to the disk, and there is a risk of head crashes and data loss. Specially manufactured sealed and pressurized disks are needed for reliable high-altitude operation, above about 10,000 feet (3,000 m). This does not apply to pressurized enclosures, like an airplane pressurized cabin. Modern disks include temperature sensors and adjust their operation to the operating environment. Very high humidity for extended periods can corrode the heads and platters. If the disk uses "Contact Start/Stop" (CSS) technology to park its heads on specified sections on the platters when not operating, increased humidity can also lead to increased stiction (the tendency for the heads to stick to the platter surface). This can cause physical damage to the platter and spindle motor and cause a head crash. Breather holes can be seen on all disks—they usually have a sticker next to them, warning the user not to cover the holes. The air inside the operating disk is constantly moving too, being swept in motion by friction with the spinning platters. This air passes through an internal recirculation (or "recirc") filter to remove any leftover contaminants from manufacture, any particles or chemicals that may have somehow entered the enclosure, and any particles or outgassing generated internally in normal operation. Close-up of a hard disk head suspended above the disk platter together with its mirror image in the smooth surface of the magnetic platter. A hard disk failure occurs when a hard disk drive malfunctions and the stored information cannot be accessed with a properly configured computer. A disk failure may occur in the course of normal operation, or due to an external factor such as exposure to fire or water or high magnetic waves, or suffering a sharp impact, which can lead to a head crash. The severity of disk failures vary. The most notorious and famous kind is a head crash, where the internal read-and-write head of the device touches a platter. A head crash usually incurs severe data loss, and data recovery attempts may cause further damage if not done by a specialist with proper equipment. A hard drive also includes controller electronics, which occasionally fail. In such cases, it may be possible to recover all data. Hard drive platters are coated with an extremely thin layer of non-electrostatic lubricant, so that the read-and-write head will simply glance off the surface of the platter should a collision occur. However, this head hovers mere nanometers from the platter's surface which makes a collision a realistic risk. Another cause of failure is a faulty air filter. The air filters on today's hard drives equalize the atmospheric pressure and moisture between the hard drive enclosure and its outside environment. If the filter fails to capture a dust particle, the particle can land on the platter, causing a head crash if the head happens to sweep over it. After a hard drive crash, each particle from the damaged platter and head media can cause a bad sector. These, in addition to platter damage, will quickly render a hard drive useless. Since hard drives are mechanical devices, they will eventually fail. While some may not die prematurely, many hard drives break down simply because of worn out parts. Many hard drive manufacturers include a Mean Time Between Failures figure on product packaging or in promotional literature. These are calculated by constantly running samples of the drive for a short amount of time, analyzing the resultant wear and tear upon the physical components of the drive, and extrapolating to provide a reasonable estimate of its lifespan. Since this fails to account for phenomena such as the aforementioned head crash, external trauma (dropping or collision), power surges, and so forth, the Mean Time Between Failures number is not generally regarded as an accurate estimate of a drive's lifespan. Hard drive failures tend to follow the concept of the bathtub curve. Hard drives typically fail within a short time if there is a defect present from manufacturing. If a hard drive proves reliable for a period of a few months after installation, the hard drive has a significantly greater chance of remaining reliable. However, a hard drive can fail at any time in many different situations. Due to the extremely close spacing between the heads and the disk surface (on the order of nanometers), any contamination of the read-write heads or platters can lead to a head crash—a failure of the disk in which the head scrapes across the platter surface, often grinding away the thin magnetic film. For giant magnetoresistive (GMR) heads in particular, a minor head crash from contamination (that does not remove the magnetic surface of the disk) still results in the head temporarily overheating, due to friction with the disk surface, and can render the data unreadable for a short period until the head temperature stabilizes (so called "thermal asperity," a problem which can partially be dealt with by proper electronic filtering of the read signal). Head crashes can be caused by electronic failure, a sudden power failure, physical shock, wear and tear, corrosion, or poorly manufactured platters and heads. 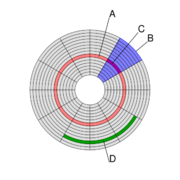 In most desktop and server disks, when powering down, the heads are moved to a landing zone, an area of the platter usually near its inner diameter, where no data are stored. This area is called the CSS (Contact Start/Stop) zone. However, especially in old models, sudden power interruptions or a power supply failure can sometimes result in the device shutting down with the heads in the data zone, which increases the risk of data loss. In fact, it used to be procedure to "park" the hard disk before shutting down your computer. Newer disks are designed such that either a spring (at first) or (more recently) rotational inertia in the platters is used to safely park the heads in the case of unexpected power loss. The hard disk's electronics control the movement of the actuator and the rotation of the disk, and perform reads and writes on demand from the disk controller. Modern disk firmware (software that is embedded in a hardware device) is capable of scheduling reads and writes efficiently on the platter surfaces and remapping sectors of the media which have failed. Also, most major hard disk and motherboard vendors now support self-monitoring, analysis, and reporting technology (S.M.A.R.T. ), which attempt to alert users to impending failures. However, not all failures are predictable. Normal use eventually can lead to a breakdown in the inherently fragile device, which makes it essential for the user to periodically back up the data onto a separate storage device. Failure to do so can lead to the loss of data. While it may be possible to recover lost information, it is normally an extremely costly procedure, and it is not possible to guarantee success in the attempt. A 2007 study published by Google suggested very little correlation between failure rates and either high temperature or activity level. While several S.M.A.R.T. parameters have an impact on failure probability, a large fraction of failed drives do not produce predictive S.M.A.R.T. parameters. Microphotograph of a hard disk head. The size of the front face is about 0.3 mm × 1.0 mm. The (not visible) bottom face of the slider is about 1.0 mm × 1.25 mm and faces the platter. One functional part of the head is the round, orange structure in the middle—the lithographically defined copper coil of the write transducer. Also note the electric connections by wires bonded to gold-plated pads. Spring tension from the head mounting constantly pushes the heads towards the platter. While the disk is spinning, the heads are supported by an air bearing and experience no physical contact or wear. In CSS drives the sliders carrying the head sensors (often also just called heads) are designed to reliably survive a number of landings and takeoffs from the media surface, though wear and tear on these microscopic components eventually takes its toll. The heads typically land in a "landing zone" that does not contain user data. Most manufacturers design the sliders to survive 50,000 contact cycles before the chance of damage on startup rises above 50 percent. However, the decay rate is not linear—when a disk is younger and has fewer start-stop cycles, it has a better chance of surviving the next startup than an older, higher-mileage disk (as the head literally drags along the disk's surface until the air bearing is established). For example, the Seagate Barracuda 7200.10 series of desktop hard disks are rated to 50,000 start-stop cycles. This means that no failures attributed to the head-platter interface were seen before at least 50,000 start-stop cycles during testing. Around 1995 IBM pioneered a technology where a landing zone on the disk is made by a precision laser process (Laser Zone Texture , LZT) producing an array of smooth nanometer-scale "bumps" in a landing zone, thus vastly improving stiction and wear performance. This technology is still largely in use today. In most mobile applications, the heads are lifted off the platters onto plastic "ramps" near the outer disk edge, thus eliminating the risks of wear and stiction altogether and greatly improving non-operating shock performance. All HDD's use one of these two technologies. Each has a list of advantages and drawbacks in terms of loss of storage space, relative difficulty of mechanical tolerance control, cost of implementation, etc. Hard disk drives are accessed over one of a number of bus types, including Advanced Technology Attachment (ATA), Serial ATA (SATA), SCSI, Serial Attached SCSI (SAS), and Fiber Channel. Bridge circuitry is sometimes used to connect hard disk drives to busses that they cannot communicate with natively, such as IEEE 1394 and USB. FireWire/IEEE 1394 and USB(1.0/2.0) HDDs are external units containing generally ATA or SCSI disks with ports on the back allowing very simple and effective expansion and mobility. Most FireWire/IEEE 1394 models are able to daisy-chain in order to continue adding peripherals without requiring additional ports on the computer itself. Bit Serial Interfaces—These families connected to a hard disk drive controller with three cables, one for data, one for control and one for power. The HDD controller provided significant functions such as serial to parallel conversion, data separation and track formating, and required matching to the drive in order to assure reliability. ST506 used Modified Frequency Modulation (MFM) (Modified Frequency Modulation) for the data encoding method. ST412 was available in either MFM or RLL (Run Length Limited) variants. Word Serial Interfaces—These families connect to a host bus adapter (today typically integrated into the "North Bridge") with two cables, one for data/control and one for power. The earliest versions of these interfaces typically had a 16 bit parallel data transfer to/from the drive and there are 8 and 32 bit variants. Modern versions have serial data transfer. The word nature of data transfer makes the design of a host bus adapter significantly simpler than that of the precursor HDD controller. Integrated Drive Electronics (IDE) was later renamed to ATA, and then later, PATA ("parallel ATA," to distinguish it from the new serial ATA interface, SATA). The name comes from the way early families had the HDD controller external to the disk. Moving the HDD controller from the interface card to the disk helped to standardize interfaces, including reducing the cost and complexity. The 40 pin IDE/ATA connection of PATA transfers 16 bits of data at a time on the data cable. The data cable was originally 40 conductor, but later higher speed requirements for data transfer to and from the hard drive led to an "ultra DMA" mode, known as UDMA, which required an 80 conductor variant of the same cable; the other conductors provided the grounding necessary for enhanced high-speed signal quality. The interface for 80 pin only has 39 pins, the missing pin acting as a key to prevent incorrect insertion of the connector to an incompatible socket, a common cause of disk and controller damage. SCSI (Small Computer System Interface) was an early competitor with ESDI, originally named SASI for Shugart Associates. SCSI disks were standard on servers, workstations, and Apple Macintosh computers through the mid-1990s, by which time most models had been transitioned to IDE (and later, SATA) family disks. Only in 2005 did the capacity of SCSI disks fall behind IDE disk technology, though the highest-performance disks are still available in SCSI and Fiber Channel only. The length limitations of the data cable allows for external SCSI devices. Originally SCSI data cables used single ended data transmission, but server class SCSI could use differential transmission, and then Fiber Channel interface, and then more specifically the Fiber Channel Arbitrated Loop (FC-AL), connected SCSI HDDs using fiber optics. FC-AL is the cornerstone of storage area networks, although other protocols like iSCSI and ATA over Ethernet have been developed as well. SATA (Serial ATA). The SATA data cable has one data pair for differential transmission of data to the device, and one pair for differential receiving from the device, just like EIA-422. That requires that data be transmitted serially. The same differential signaling system is used in RS485, LocalTalk, USB, Firewire, and differential SCSI. ↑ IBM press release on September 14, 1956, IBM. Retrieved June 14, 2007. ↑ The Era of Giant Magnetoresistive Heads Hitachigst.com. International Business Machines Corporation. Retrieved June 14, 2007. ↑ Review of Western Digital's fastest HDD as of February 2007. anandtech.com. Retrieved June 14, 2007. ↑ Failure Trends in a Large Disk Drive Population, Barroso, L.A., et al.Google Labs, Google, Inc. Retrieved June 14, 2007. ↑ Seagate Barracuda 7200.10 series product manual, Seagate. Retrieved June 14, 2007. Al Mamun, Abdullah, Guoxiao Guo, and Chao Bi. 2007. Hard disk drive: mechatronics and control. Automation and control engineering, 23. Boca Raton, FL: CRC Press. ISBN 0849372534. Callister, William D., Materials Science and Engineering: An Introduction. Wiley and Sons, 2006. ISBN 0471736961. Grochowski, E., Halem, R. D., Technological Impact of Magnetic Hard Drives on Storage Systems. IBM Systems Journal 42:7. Khizroev, Sakhrat, and Dmitri Litvinov. 2004. Perpendicular magnetic recording. Boston: Kluwer Academic. ISBN 1402027230. Mee, C. Denis, and Eric D. Daniel. 1996. Magnetic storage handbook. New York: McGraw-Hill. ISBN 0070412758. Stevens, L. D. Sep 1981. Evolution of Magnetic storage, IBM Research and Development Journal 25:1-3. Thompson, D. A., J. A. Best. May 2000. The Future of Magnetic Data Storage. IBM research and development Journal 44:6. Young, Hugh D, and Freedman, Roger A. 2003. Physics for Scientists and Engineers 11th ed. San Fransisco, CA: Pearson. ISBN 080538684X. History of "Hard disk drive"
This page was last modified on 27 July 2017, at 23:02.